Three weeks into the new year and I've already missed a Little Loves post... So much for taking part each week! Last week I didn't reflect upon my week and look at the positives. In part I totally forgot Friday had rolled around and by time I realised, after seeing everyone tweet their posts, I just didn't make the time to sit down and write. 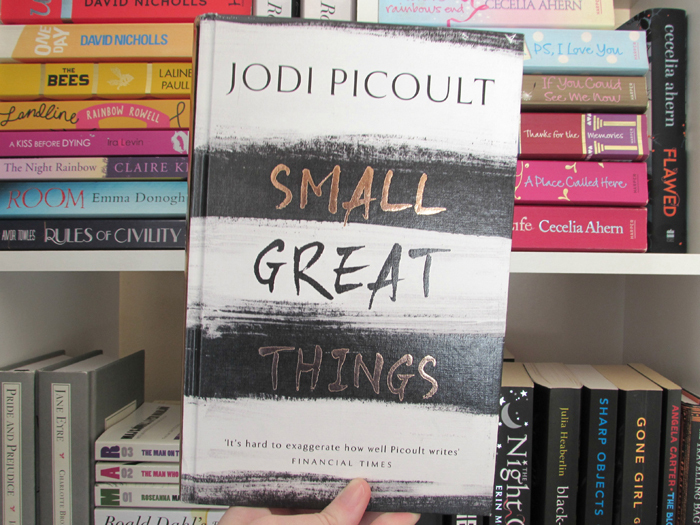 So not only was it because of timing, but also we had such an odd week, and whilst I probably could have done with looking at the little things from the week, I just didn't. But not this week. I'm back at it, and I'm looking forward to hearing all about your week, as well as looking back upon my own. We've had a house full of sickness this week, in varying forms, with Alexander having had more time off of nursery this week than in it. It has been a pretty exhausting week and looking back on this little things has really helped to not write the week off as rubbish. 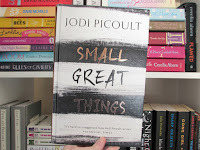 I've been juggling two books this week: Small Great Things by Jodi Picoult (our #BookClub140) pick for January, as well as Swimming Lessons by Claire Fuller. Speaking of books, we also made our first trip to the library in 2017. We used to visit the library at least once a week prior to Alexander starting nursery, and even though he only attends an afternoon session, we haven't found a good time to fit visits in. We're now making it a part of our routine, planning to stop off each Wednesday after nursery has finished - there are no constraints that way. No needing to rush because nursery starts in X amount of time, or lunch needs to be had, or dinner needs to be made, or the library is going to close. The library is open later on a Wednesday (6pm) and I'll stick a meal in the slow cooker - Wednesday early evenings are now for book browsing and I have no complaints about that! This week has been about re-watching for me. Not only have I started watching the Harry Potter films again, but I also re-watched a documentary on Netflix - Minimalism: A Documentary About The Important Things. By no means am I a minimalist, but something I have been focusing on for the past year or so is streamlining, simplifying and contentment. I first watched this minimalist documentary at the very end of last year, and found it to be powerful viewing, and a documentary I recommend all to watch. I don't tend to re-watch documentaries, films yes but not documentaries, however I felt very drawn to watching this again. Alexander has said his first Welsh word this week. Having been in nursery for just over two weeks now, Alexander has said 'shami', which is Welsh for hello. We don't really use Welsh words too much at home, namely because we don't know much Welsh, but we fully intend to work on that now that Alexander is in schooling and will be learning and using the language on a daily basis... Given that we live in Wales, we always wanted to learn the language ourselves, but it made most sense to us to wait until Alexander started nursery and in a way we can all learn together. Many tracks have been made in our house this week. Daddy and Alexander have been engineering all sorts of Hot Wheels tracks this past weekend, and having a lot of fun with it together. Cars seem to be reserved for Nathan and the train tracks for me. Wellies, raincoats, layers, waterproofs... I think you get the picture! Alexander has a new interest - photography. He is obviously very aware of me taking pictures constantly, for my blogs and otherwise, and has started to take his own pictures on the camera as well as asking others to take pictures of him showcasing items (case in point being the picture to the left). I love that he has started showing an interest in photography, and whilst it may just be a phase, I find it too cute and am all too happy to indulge him. Also, Alexander has a new pet. Alongside the hamsters and fish, we now have the pet dragon Alexander has been hatching at nursery since the start of term. The dragon and photography go hand in hand as for homework the children have been documenting all the adventures they've been having with their pets and Alexander has been keen on taking pictures of his dragon. In case you're wondering, the dragons are pieces of paper that the children coloured and the teachers laminated, however they worked on hatching eggs before the dragons flew away - we found Alexander's dragon had returned to him when he woke up with him tucked up in bed next to him. I think it's a cute little assignment. I've been meaning to look into the podcasts. The photos children take can be pretty interesting. Haha! Haha! I definitely think I'll have to be getting Alexander a kids camera some time soon. I don't think I have the nerves for continued use of my own! Children pick up languages really quickly! I'm amazed really, G is learning French at school and it's wonderful to listen too. I have a photography loving little one too, I end up going through either my phone or iPad at the end of the evening to 100s! I know, right?! Soon enough he'll be able to say more Welsh words than we know! It's lovely hearing them speak another language. Haha! Children do take some interesting pictures! I'm so over winter now, and ready to welcome spring with open arms... Shame we still have a while until its arrival. Haha - it's good to not only learn new words, but put them into practice as you say. If you like words, then you would perhaps like a book titled 'Lost in Translation' - its a small little thing with 50 words from various languages around the world that do not directly translate into English words but have such unique and charming meanings. Good luck with improving your French! The photography is very cute. Love the idea of you all learning Welsh together. Learning Welsh together seems like a good idea, however I'm sure Alexander will excel both of us parents in no time what with being surrounded by the language in school! I think all learning Welsh together will be nice, however I'm sure Alexander will be way above and beyond both mine and Nathan's vocabulary in no time what with being surrounded by it in school! That's great that your teen is so into photography! I hope you're able to visit your new local library soon - so many resources! I've recently watched the minimalism Netflix documentary too and found it fascinating. I'm always wanting to streamline but I find it so hard with kids who love crap! Haha. When we move house eventually it will be the perfect excuse to get rid of a lot of stuff we don't need. YES! Alexander's stuff is where I find streamlining the hardest! Moving is a good time to declutter as it really makes you think - do I want / love / need this enough to pack it up. The minimalism programme on Netflix sounds really interesting, I'll have to give it a go, although it will eat into my American Horror Story time! Haha! That's the thing with finding new shows! Ah, Alexander is the same with keeping the camera still - I have to do that part for him at the moment. I hope you've had a great weekend, and a lovely week too!